I’m still partially deaf and slightly bruised from seeing Of Montreal deliver a dazzling performance, that proved more than worthy of the enormous glitter ball that dangles above the main floor at the Koko nightclub, in Camden London on this their only UK date of their tour (apart from an acoustic set at Rough Trade East earlier this week). Following a no show from supporting act The Wave Pictures and a short set from Eugene McGuinness we waited, for what felt like an eternity, for headliners Of Montreal to take to the stage. The predominantly young crowd was growing increasingly rowdy with anticipation (btw I had no idea Of Montreal had picked up such a following in the UK). I was standing one row back from the stage, crushed up so tight to the person in front of me I could smell what they had eaten for dinner (if you're interested I'm almost positive it was garlic sausage!). Thanks to a group of girls standing behind me I had elbows hammering away at my kidneys often enough that I feared a spinal injury before the night was over! This was going to be one hell of a show and at this stage there was no way out - I couldn’t have moved if I wanted. I gazed longingly at the vast expanses of the press photo pit and stared enviously into the back of the photographers as they took their time perfecting their shots. 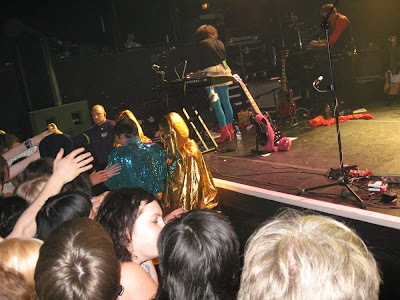 There I was trying to get photos worthy or sharing with you guys out of my little compact camera but being one row back from the front there was no luxury of a barrier to steady my arms. I did consider resting my camera on the head of the very short girl standing infront of me but I guess that’s not a very nice thing to do, so I didn’t. This latest tour illustrates the life, death and resurrection of Kevin Barnes’ (the bands lead man) stage persona George Fruit. 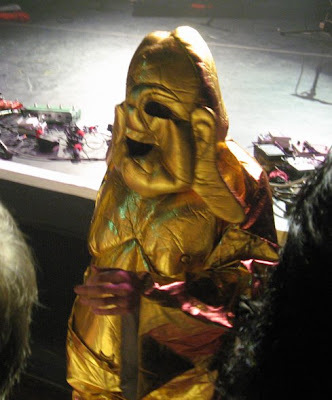 Accompanied by two gold painted padded suit Buddhas, Barnes (George Fruit) skipped onto the stage bursting with energy and it was insanely captivating from the very first note. The funky buddhas climbed out of their impossibly huge suits and turned into ninjas who were soon accompanied by people dressed as a satyr and a whole carnival of animals including chickens, tigers, pigs and elephants amongst a host of acts. 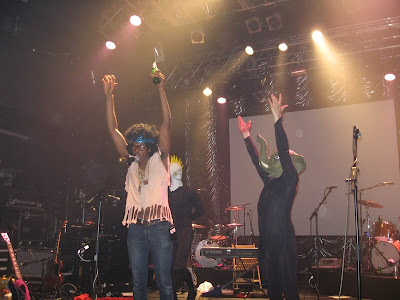 With no breaks between the first eight songs, this gig took on the feel of a dance/rock opera type musical. I’m not going to try to fit this band into a genre; it wouldn’t help you understand what they’re about one iota! Instead, here’s a list of all the sounds and influences I thought I could hear last night (bear in mind this was one gig, one band and it lasted about one hour): David Bowie, Elton John, Scissor Sisters, very early Queen (I could imagine George Fruit enjoying singing the last five songs from Queen II), all mixed together with a huge twist of psychedelia, a lesson in Greek history and generous sprinkle of indie pop. Got that? Make sense? A lot of the sounds I just mentioned wouldn’t normally appeal to me, just Bowie and early Queen but mixed together, Of Montreal have very cleverly crafted a unique sound that is not only really captivating, it's also very addictive. 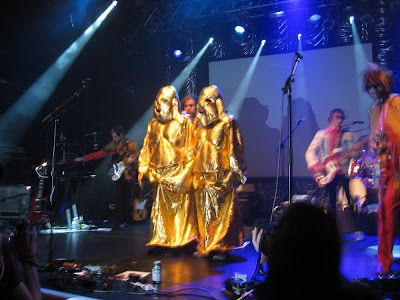 About half way through the set, George Fruit was disrobed by two masked creatures revealing his Kylie-esk gold pants (and apart from a pair of silver strapped heeled shoes that was ALL he had on) his body was then smeared with red paint (as you do)! Here's a photo of the moment the robe dropped and the reason why everyones jaws hit the floor! The moment the robe dropped! There was an energy to this band that was impossible to not enjoy. Combining the music, theatrics and low budget costumes it was truly entertaining - they delivered a spectacular extravaganza worthy of a west end show, only ten times better! 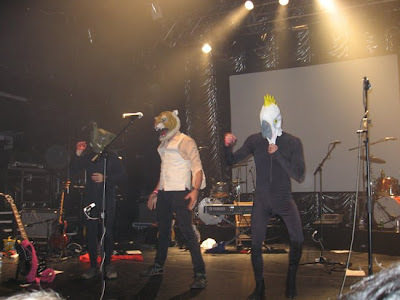 Unlike their recent New York show, there was no horse riding, nooses or coffins but we were treated to a fantastic finale, in the form of a cover of Nirvana's Smells Like Teen Spirit. Admittedly grunge rock and the musical extravagance Of Montreal had served up during the evening couldn't be placed more further apart on the musical spectrum but Ladies and Gentleman of the class of ’91, their version was probably the best you’ll hear live since Kurt last attempted it. A HUGE thank you to crazybobbles who sorted me out with a ticket to one of the best concerts I've seen in the last 4 years (for me this was up there with seeing Kraftwerk @ the Brixton Academy in 2004). 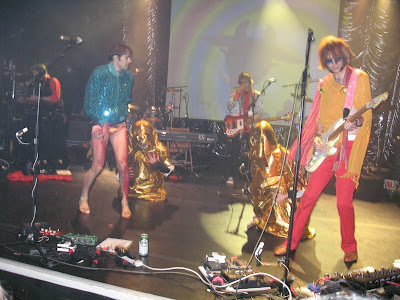 Of Montreal are the hottest ticket in town right now, they've even had MTV comparing their tour to Madonnas and came out on top! I'd really recommend trying to get a ticket if they're going to be playing in your town although if the thought of attending a costume clad indie pop extravaganza makes you feel queasy then you’d do best to stay away! 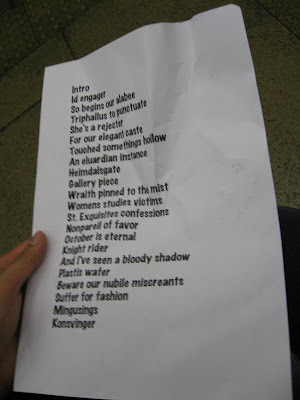 Here’s the setlist and my slightly blurry photos - sorry it was just impossible to stand still to take these photos because of the girls who were killing me with their elbows! Here are some other links to interviews, albums, myspaces and a George Fruit recipe for making cookies. That sounds like it was a great concert, and some fantastic photos too.